CHICAGO -- Once again, the sun beat down on a sweltering day in late June as thousands lined a parade route that stretched from United Center on the west side all the way to Grant Park near Lake Michigan. 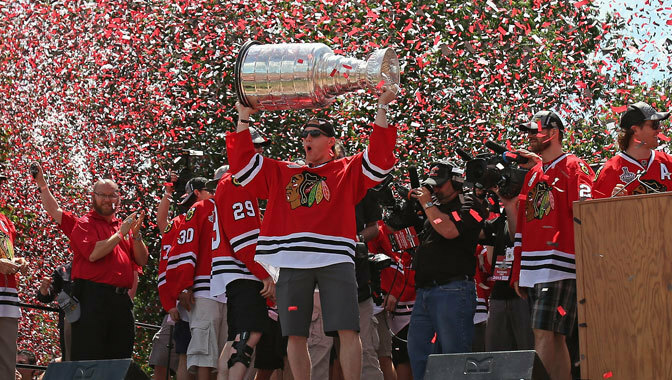 Once again, three years after flooding the streets with red and black for the same reason, fans of the Chicago Blackhawks didn't care a bit about the heat or the crowds, showing up en masse Friday morning for another memorable Stanley Cup victory parade. They lined up outside United Center and gathered in large groups all along the way, as a procession full of packed trolley cars and double-decker buses carrying players and their families rolled past. There was confetti galore along Columbus Avenue, shot out of air cannons, and just like three years ago, the Blackhawks soaked in every second. "The only reason this day is fun is because of all you guys coming out and supporting this team," right wing Patrick Kane said at the massive rally after the parade, held in Grant Park's Hutchinson Field. "It makes hockey fun. There's a saying we used throughout the playoffs that represents this team perfectly: That's hockey, baby!" Kane, who won the Conn Smythe Trophy as MVP of the 2013 Stanley Cup Playoffs, then handed over the Blackhawks' coveted heavyweight belt to goalie Corey Crawford, who many in Chicago felt should've won the Conn Smythe. The belt came into existence during the 2010 season, and Kane was given it last that year for his overtime goal in Game 6 that gave the Blackhawks their first Stanley Cup in 49 years. This time, pulling the belt out of a red bag, Kane handed it to Crawford with a message he shared with everybody in attendance. "I got a little present in here, a trophy we give out after every game: the belt," Kane said. "I think it should go to the best player in the playoffs, No. 50, Corey Crawford." Crawford lifted it high then addressed the crowd with an exuberant -- and not G-rated -- couple of sentences before Blackhawks captain Jonathan Toews brought out the prized possession that always makes people in this city crazy when they first see it, the silver chalice all NHL players chase but only a select few hoist each season, the Stanley Cup. "This is unbelievable," Toews said, staring into a sea of fans stretching for what seemed like forever, or at least all the way to Buckingham Fountain, which was barely visible in the distance. "For the guys that were here in 2010, we didn't think there was a chance we could outmatch that performance by the fans, but you guys did it somehow. This shows how unbelievable this city is." 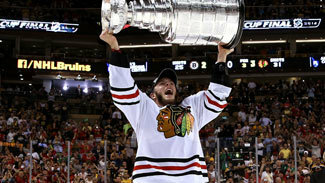 After the cheering lulled, Toews concluded another memorable parade and rally that drew an estimated crowd of 2 million. His voice still raspy from a full week of celebrating, he summed up a special season in Chicago by saying this team was a lot like its city, and for a second time in four seasons, the Second City was second to none. "I can't think of team, a better bunch of guys to represent this city," Toews said. "Hard-working guys, down-to-earth guys, who go out there and play for each other every single shift. [That] represents this city and what it means right here. To bring the Stanley Cup home twice in four years is absolutely unbelievable." Imagine how Blackhawks general manager Stan Bowman felt. Friday was his 40th birthday and he's already on his second Stanley Cup championship as GM, a number that is very impressive even if it's still 11 behind the 13 titles his legendary father and Blackhawks senior adviser, Scotty Bowman, can now claim. "Finally, I want to admit I'm not much of a birthday celebration guy," Bowman said at the rally, speaking after Blackhawks chairman Rocky Wirtz and John McDonough, the team's president and CEO. "But as I stand here today and look at the crowd and I see people as far as the eye can see, I have to say that without a doubt this will be the greatest birthday celebration ever. So, thank you." Unless, that is, the Blackhawks can follow through on a suggestion by left wing Patrick Sharp. "In 2010, you guys waited 49 years to do this [and] this year we waited three," he said on stage. "What do you say we get back here and do it again next year?" If they can, a full-fledged hockey dynasty will become a reality and there's no telling what that parade might look like. "Today is a reward to our great fans that gave us a chance and they came back in droves," McDonough said, referring to the team's lean years in the not-too-distant past. "We will never waver from our 'One Goal' [mantra], as it is important that we continue to deliver consistent excellence in our organization. We are very proud to represent the City of Chicago. Those of us who are from Chicago, we are Chicago proud. Congratulations."